OK, thank you for clarifying that for me. Now, with that in mind, why will the QNAP try to connect to the domain controller as: nsdc-dc.nsdc-dc.ad.mydomain.local? [Security mode] Failed to join domain. Cannot resolve domain. 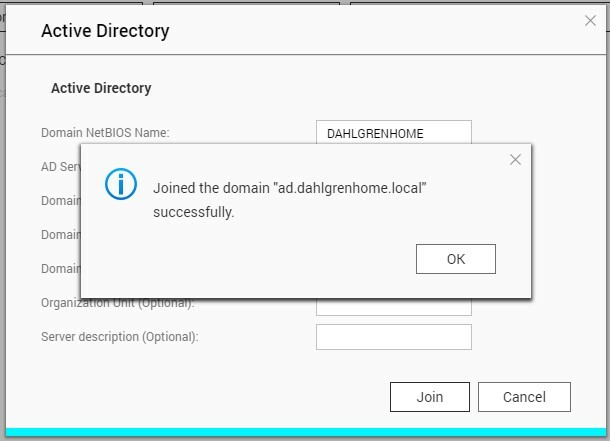 Check DNS server, AD servewr name and Domain. What name should I put in the DNS? Check settings in this page. 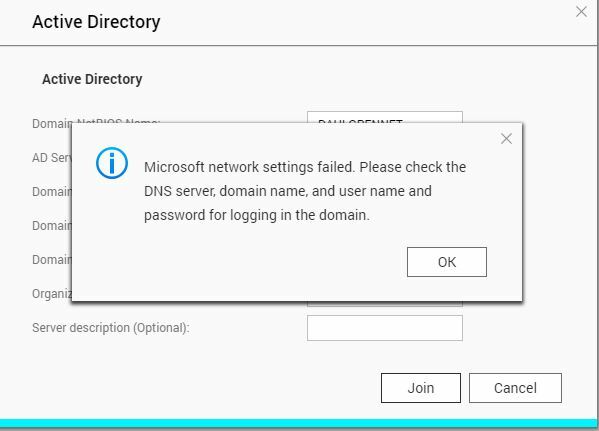 Do not set an host that’s not an AD domain controller as secondary DNS: it might lead to problems as it does not have records required by AD clients. Now, with that in mind, why will the QNAP try to connect to the domain controller as: nsdc-dc.nsdc-dc.ad.mydomain.local ? The domain suffix must match the AD one. The DNS domain name of AD is ad.mydomain.local. You put the FQDN of the DC instead! Do the QNAP NAS has the same computer/hostname that had before? Was the Computer Account removed from the NSAD structure? I have installed a Microsoft Domain server and connected the QNAP to it with no problem. To the best of my understanding, the QNAP is configured correctly, so the error is located on the NethServer, and probably in the DNS area. so the error is located on the NethServer, and probably in the DNS area. This is possible but is not the only explanation, because others succeeded in a similar task. This is bogus, for sure. Maybe I am wrong… DNS server used by qnap should be the container (nsdc) or Nethserver? I have the same problem on a QNAP TS-421 and a TS-453-PRO. Nor can I join the samba domain. Have also tried all versions of FQDN, check that I can ping the domain compter as well as ad.domain.local also get an ip back. And I do. I have to try all the tips here on this topic. First thing check that your QNAP firmware is up to date. Do you need that QNAP will be a remote domain controller or only a member of domain? 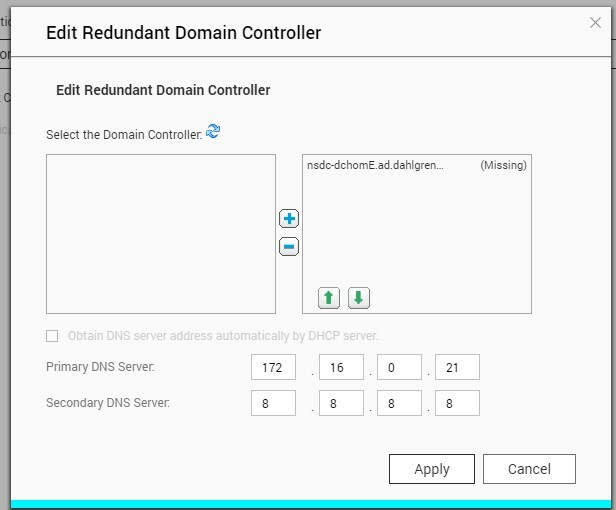 If you set a remote domain controller in read-only mode it should work. After i tried myself, with different combinations of name. is it new successful to get through the qnap domain wizard. Can you try to set up a domain not .local and use a domain.ext and join? So what you say is that i need to create a domain called .ext and not.local?